The headline says “DNA Tests Confirm Bear Was a Hybrid” (see also here). “Was”, as in, this is an ex-bear. It was a naturally occurring interspecies hybrid; now it’s a corpse, since some dickless macho yuppie fuckbag stood off a safe distance with a high powered rifle and a telescopic sight and killed it, presumably because wasteful slaughter is a soothing salve for the inflammation of the ego that comes with being a sniveling coward who wants so very badly to be a tough guy. 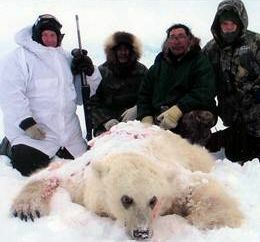 I hope “hunter” Jim Martell (left, in the chic white parka) dies of explosive rectal prolapse. I hope it happens on his very next “hunting” trip, and I hope he is still conscious when whatever he was “hunting” wanders over and starts gnawing on his guts.